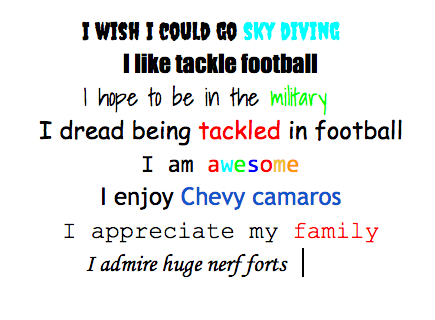 Lesson 5 - Google Docs 5th Grade "Portrait Poems"
​1) Complete 5 minutes of keyboarding practice. 3) Complete the Portrait Poem Lesson. After you've completed steps 1 & 2, watch the video below and create a Portrait Poem about YOU! Today's lesson is to great a Portrait Poem about yourself in Google Docs. You are going to use your creativity and create a "portrait" of yourself with your words. You will follow the guideline below to create your poem! After you watch the video, go to a new tab and open your drive. Go to "New" and open a NEW GOOGLE DOC. Name your document: Your first & last name, Portrait Poem.